Our player base is mostly located in the USA, but we have members throughout the world. We do Ediolons, Events & Activities. PLAYERS MUST BE AGE 18+ AND AGREE TO JOIN OUR DISCORD VOICE CHAT. Our members strive to keep the overall atmosphere of Primarch respectful and cooperative. Our age requirement is in place to reduce the incidence of random conflicts and enhance the overall spirit of cooperation among its members. While people of all ages can be mature, we find that players who are 18 or older are more inclined to uphold these values due to life experience. If you do not meet our age criteria, please consider reapplying in the future once you do. This is the common question we get, since some of our games are multi-platform. please note Primarch plays the PC version of Warframe only. Primarch has its own custom emblem you can wear on your shoulder in game. Primarch Alliance has its own custom emblem you can wear on your other shoulder in game. 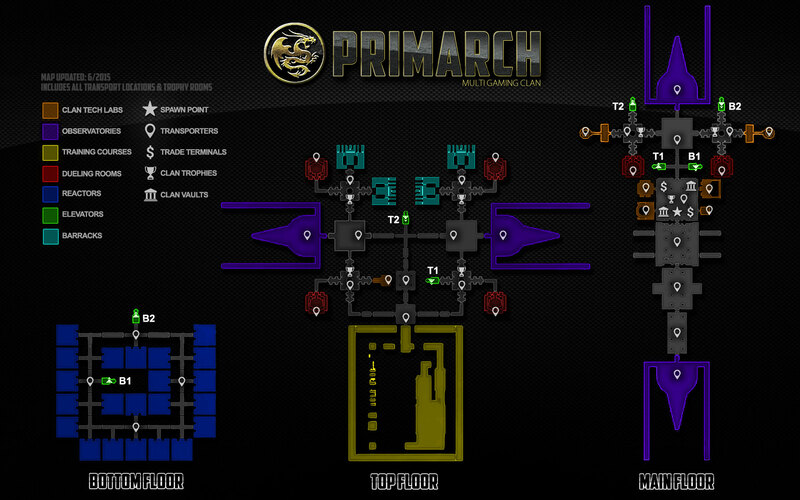 Primarch Dojo is carefully constructed to put all the important rooms as close to the spawn point as possible! Our Trading Terminals and all primary Clan Tech (Bio Lab, Chem Lab, Energy Lab, Tenno Lab) are thoughtfully & conveniently placed in the same exact room you spawn into! You do not have run long distances these common activities. We have teleportation pads to every major room in the dojo for instant access. Our clan trade tax is 0% and will always remain 0% forever, so you can feel free to host all your trades in our clan dojo! No expense was spared in fully decorating every single room of our Primarch Dojo. Our members pull together and donate a vast amount of resources to keep our Dojo up to date. We want Primarch’s Dojo to be exquisite in every last detail. Our goal was to give all our members a sense of pride and a place that they are all proud to call home. We want visitors to be instilled with respect and awe when exploring our Dojo. From all the resounding compliments from people within and outside of the clan… we succeeded on all accounts! We do not rest on our laurels though! As DE continues to add more decoration content to the game we continue to expand and renovate our dojo to keep it up to date and modern. Please enjoy a few screenshots of our Dojo below. Screenshots do not do our Dojo justice, it must be seen in person to appreciate in all its glory. If you wish to arrange a visit to our Dojo, please contact one of our officers for a tour. A majority of this game is leveling and farming. To that end… we are always running groups. Primarch members know all the perfect farm locations. We know which frames and spots allow us to farm the most resources in shortest time possible. We run Void and Derelict quite often throughout the day. If you are in need of clan tech researched items, Primarch has you covered! We currently have all available clan tech researched, so you can find the exact clan tech you need. As the developer continues to release new clan research every couple of weeks, we always research things right away too! Every once in a while, DE releases extremely high material requirement research projects. In those few instances, we post in game announcements with the latest major project and everyone pitches in and get it done. Primarch has highly skilled “Tridolon” teams that maximize speed and rewards. Click the button just below here to apply today!